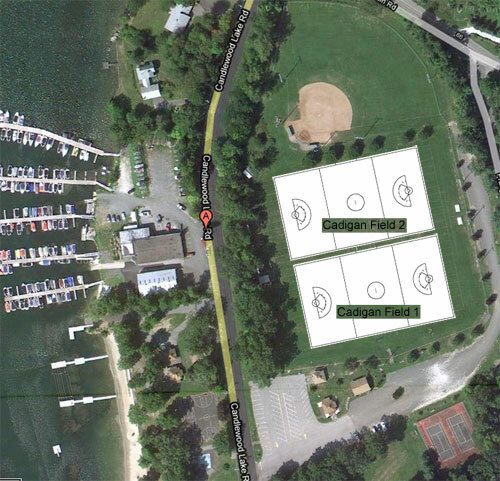 The field is located at 458 Candlewood Lake Rd. From I-84 east or west take Exit 7, "Route 7 and 202/Brookfield". Exit becomes a 4-lane highway extension called super 7. Exit at the first exit "Federal Road". Turn left at end of ramp. Continue straight through next 3 lights. With OfficeMax on left and travel up Candlewood Lake Road. Continue straight for 3.6 miles passing through the yellow blinking light. Turn right into the parking lot, across from the town beach. If you get to the Candlewood Lake Inn you have just passed the field. From North of Brookfield coming South on Route 7 go to the junction with Route 25 (Four Corners). Turn right onto Station Road and go to the stop sign. Turn right, and then take first left onto North Mountain Road. Go all the way to the stop sign and turn left onto Candlewood Lake Road. 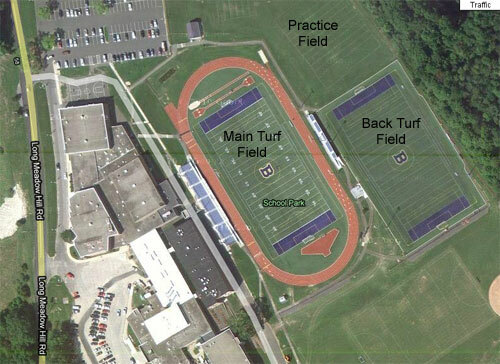 Take 1st left into the parking lot for Cadigan Field.